Craig Tapp (aka Tappy) is an Aboriginal arts and cultural youth mentor who supports the maintenance and promotion of culture of the clans of the Quandamooka people and region. Tappy’s artwork includes acrylic on canvas, sand art on canvas, jewellery design carved from dugong bone and coral. As an environmental/ecological ephemeral art, Tappy creates designs in the sand using coloured sand, quampie shells, eugarie shells, quampie pearls, black coral, red, blue, green and yellow mineral sands and clay which highlights the celebration of nature and the need to reclaim damaged landscapes, restore ecosystems to establish a balanced coexistence with natural systems. 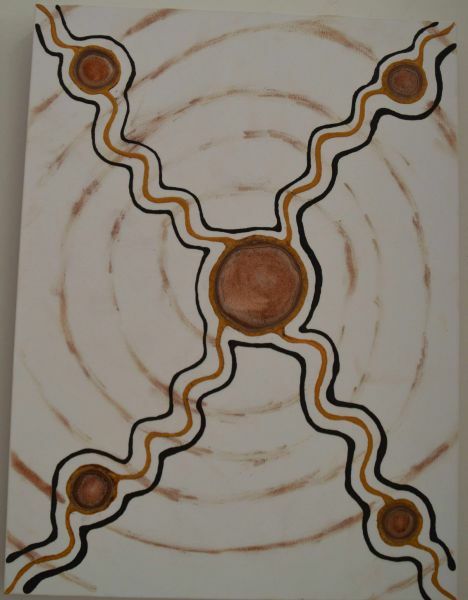 Tappy commenced his art career in 2000 which includes a spiritual journey through Central Desert for one year.